One of the main appeals of the Rally Deutschland is the challenging mixture of a variety of track conditions—from twisted support roads in the vineyard stages, to rough concrete roads on the military training ground near Baumholder, to the high-speed curves of the asphalt roads in northern Saarland. One unexpected challenge that Hyundai Motorsport driver Thierry Neuville faced while testing his Hyundai i20 WRC for this year’s Rally Deutschland 2015? A tractor that happened to mosey its way onto the road and force the Belgian driver to quickly slam on the brakes. 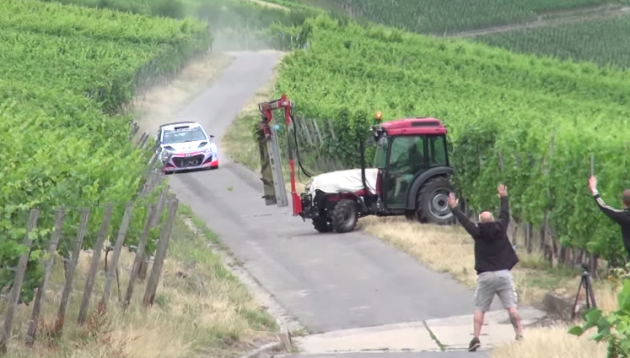 Thanks to the Neuville’s speedy reaction, and the quick-thinking of the tractor driver who quickly put his agricultural machine in reverse, not only was catastrophe avoided, but the whole thing turned into quite an effective advertisement for the Hyundai i20 WRC’s brake system. The racecar uses ventilated Brembo disc brakes, which are mated to air-cooled 4-piston calipers. As Neuville makes clear in this video, they get the job done. On Facebook, the Hyundai Motorsport driver wrote, “Brake pressure=120bar,” but frankly, we’re more curious to know how much his blood pressure spiked during the whole ordeal.